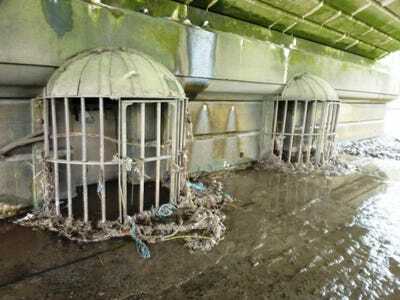 Thames Tideway TunnelLondon has already started work on the Lee Tunnel to capture sewage from overflow points in the Thames river and direct the waste somewhere else. 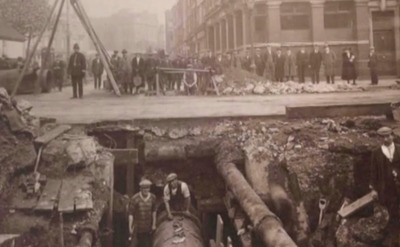 London’s Victoria-era sewer system is at its breaking point. Structurally, there’s nothing wrong. The web of underground pipes is holding together well more than 150 years after it was first constructed. But every time it pours, the system overflows. The result: Millions of tons of raw sewage empties into London’s Thames River each year, with at least one spillover every week. 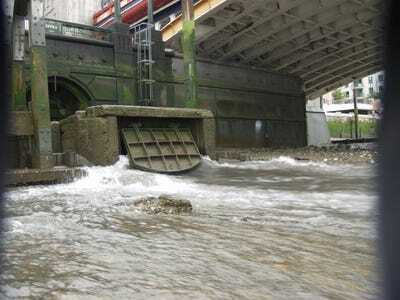 To address the problem, London is building a new £4.2 billion “super sewer“, which will keep waste out of the riverbank by directing it to other treatment plants. The project is controversial. 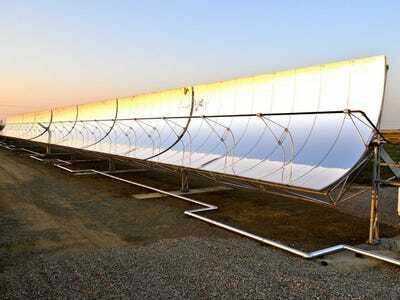 Most are concerned about the exorbitant cost, which will be funded largely by the private sector. There are some environmental worries, too. 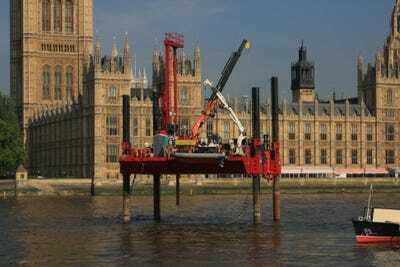 But the Thames Tideway Tunnel is forging ahead regardless. 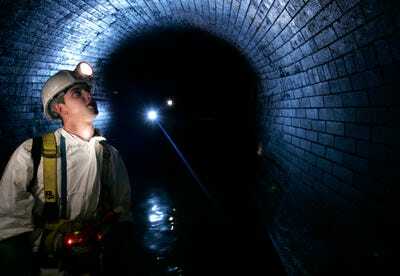 In September, Britain’s largest water utility, Thames Water, received the greenlight from the government. Construction is expected to start in 2016 and take seven years to complete. 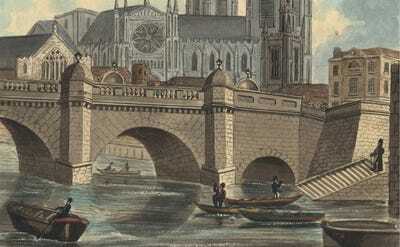 London's 160 kilometres of intersecting sewers were introduced in the second half the 19th Century. At that time, the project was hailed as an engineering feat. 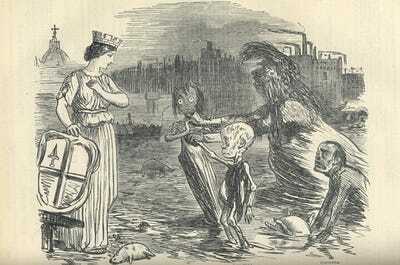 Before that, the Thames was a disease-ridden dumping ground for cesspools, dead animals, garbage, and raw sewage. 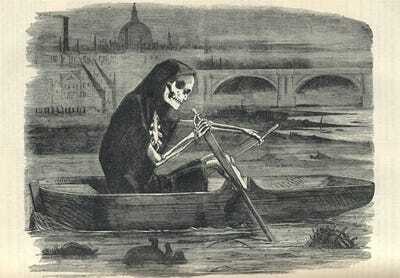 This practice went on for hundreds of years, until the summer of 1858 when an unusually intense heatwave resulted in a horrendous smell. 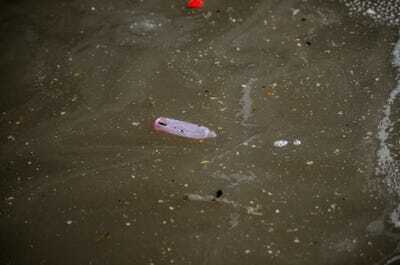 The river waste was roasting. 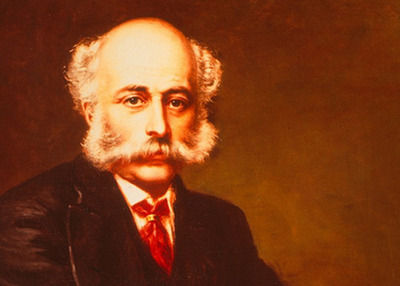 Officials brought in Sir Joseph Bazalgette, a civil engineer, and secured a £3 million budget to build a new sewer system. 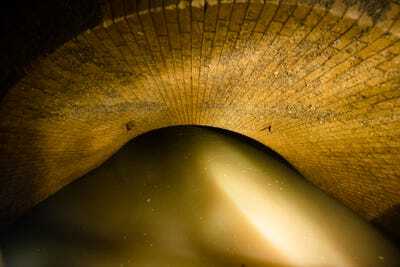 This network of underground pipes designed by Bazalgette is known as a combined sewer system. 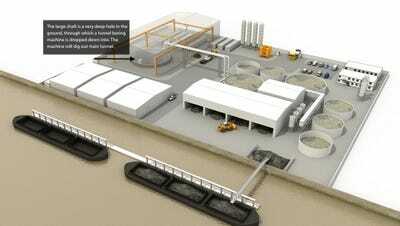 That means it collects both sewage -- the waste from your toilet -- and rainwater in the same pipes. 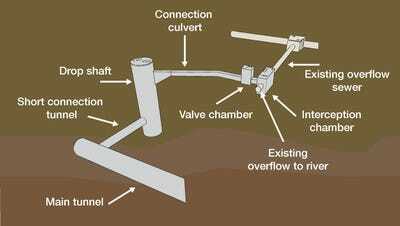 Although most of the raw sewage gets transferred to treatment plants, the system was also designed with overflow pipes, known as combined sewer outflows (CSOs). 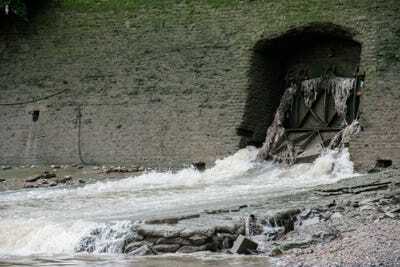 So when heavy rain overwhelms the system, the combined sewage and storm water gushes out into the Thames instead of backing up and flooding streets, buildings, and homes. 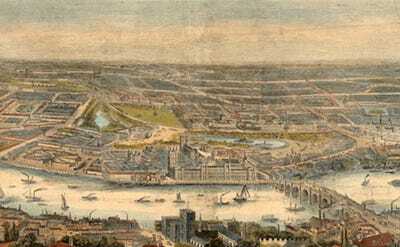 When the waste network was designed in 1868, London's population was about 2 million. The system could still fill up with rainwater and occasionally overflow, but it wasn't a big deal. 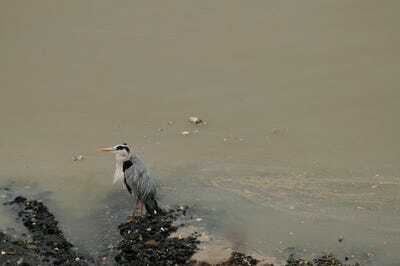 It was still a vast improvement from the days when human and industrial waste was dumped directly into the Thames. 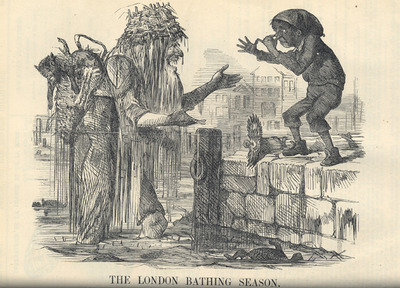 But the 21st Century brought two major changes that overwhelmed London's Victorian sewer system. 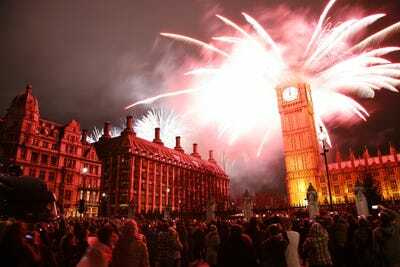 First, London's population exploded -- quadrupling to over 8 million. Bazalgette accounted for growth when he designed his system, but only to a population of 4 million. 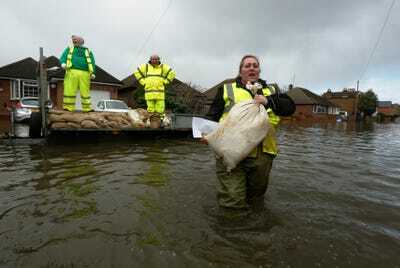 Second, weather patterns have changed as a result of climate change. Heavy downpours are more common. And conditions are only predicted to get worse: Britain's Met office expects summer rainfall events in the UK to become both more intense and to occur with more frequency by 2100, due to climate change. So the system, while still in good shape structurally, has two problems: It's overloaded because of more people and more rainfall. 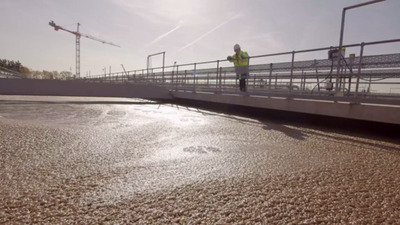 As a result, instead of the sewage flowing to treatment facilities like this, it spills into the overflow pipes and gets emptied into the Thames. 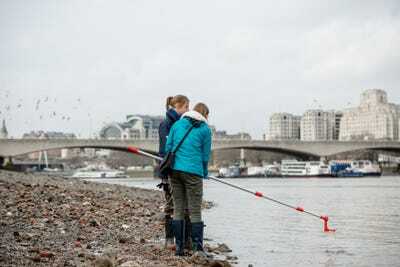 According to one study, even very light rain (just a few millimetres) will cause more than 30 of the 57 combined sewer outflows (CSOs) along the riverbank to empty into the Thames. 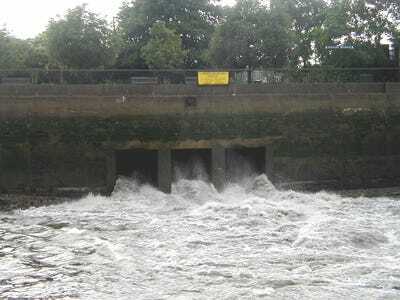 London's Environment Agency estimates that this results in 39 million cubic metres of untreated sewage being dumped into the Thames in a typical year, with at least one spillover occurring each week. 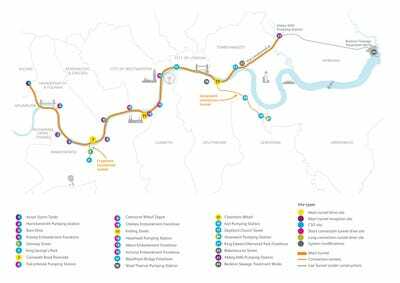 The approved Thames Tideway Tunnel will solve these issues, according to Thames Water, a privatized utility that has launched a massive campaign for the tunnel's construction. 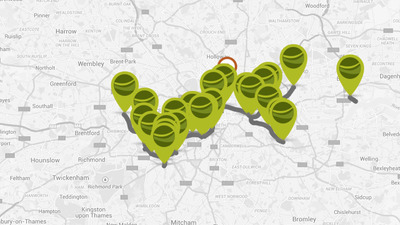 In short, the tunnel will connect to the 34 most-polluting CSOs (plotted on the map), capture the sewage that would normally flow into the Thames, and direct it somewhere else. 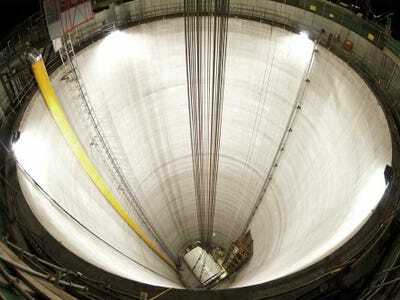 The 25-kilometre tunnel -- equivalent to the width of three big red London buses -- will run the length of the river through London, from the storm tanks in Acton, east to an existing pumping station in Abbey Mills. 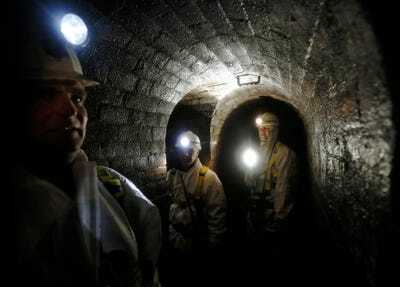 The tunnel will sit 60 metres below the city for most of its route, getting deeper as it moves east to the Abbey Mills Pumping Station. The project requires 24 separate construction sites to be set up along the river. 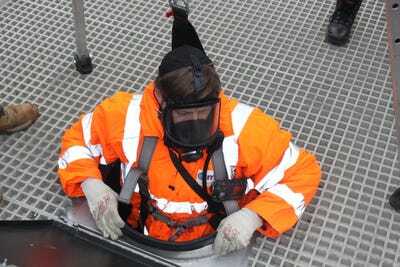 Additionally, a new 4-mile, £635 million sewer called the Lee Tunnel has been constructed at the largest sewer overflow point, Abbey Mills Pumping Station. 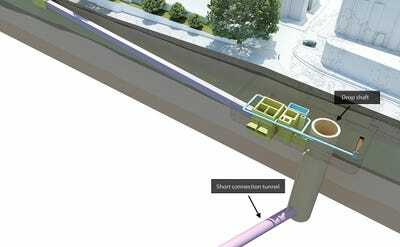 The tunnel will capture overflows that normally dump into the River Lee and transfer the extra sewage to Beckton, already one of Europe's largest sewage works. There will be three main drive sites in total, or locations where the main tunnel is excavated. 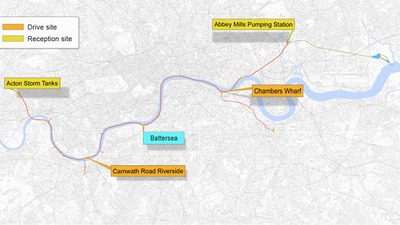 One drive site will be located at Battersea, highlighted in blue on the map. 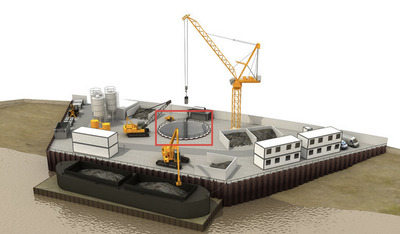 Here's one example of a tunnel boring site. The first step in constructing the site is to dig a shaft -- or very deep circular hole -- for the tunnel boring machine to enter. 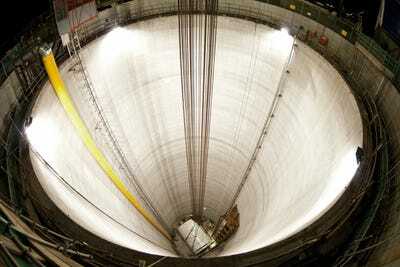 The machine will be lowered down in sections by a crane and assembled at the bottom of the shaft. 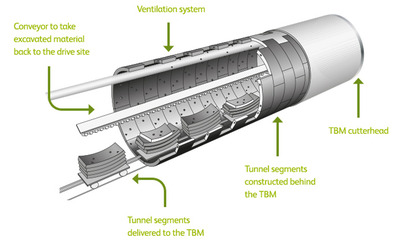 The machine will dig a circular tunnel using a rotating cutterhead. 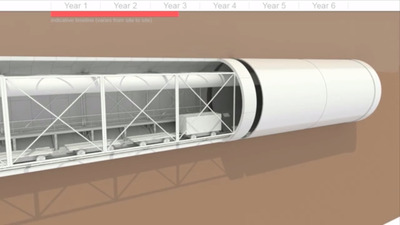 Concrete rings will be installed to create the tunnel walls. Meanwhile, as the boring machine excavates, dirt and other material will be transported out of the tunnel on a conveyer belt. 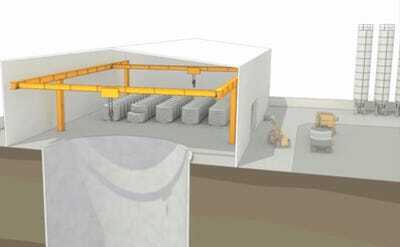 To keep the noise level down, which has been a key complaint of tunnel critics, the shaft and crane will be housed under a shed. Construction sites will also be built at most of the 34 most-polluting CSOs. These are known as 'foreshore sites.' A drop shaft, highlighted by the red rectangle, will also be constructed at these locations. The nearly 40-metre deep drop shaft, as seen in this example of a finished foreshore site, is connected to the CSO. 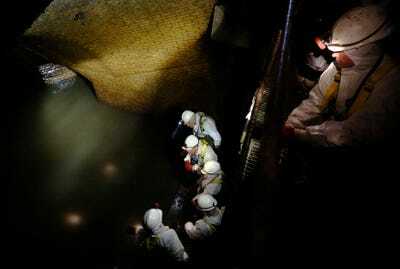 On the other side, the shaft is linked to a short connection tunnel that hooks up with the main tunnel. 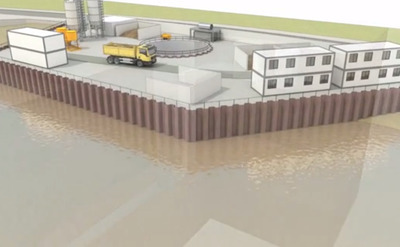 A 'cofferdam' will be built around around the foreshore site temporarily during the construction period. 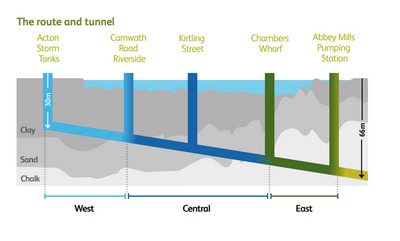 The existing CSOs will connect to the main tunnel via an underground drop shaft. 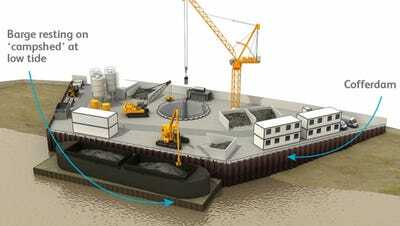 A barge will remove the excavated dirt. 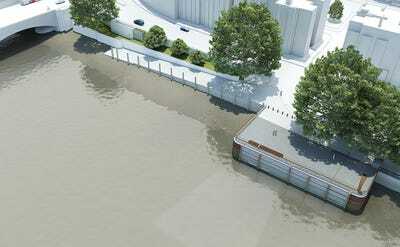 Here's an example of the Putney Embankment foreshore site on the southern bank of the Thames. 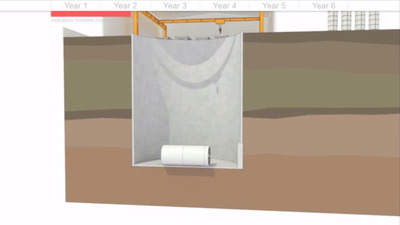 Once construction is complete, the area will be landscaped over so that most of the sewer structures, like the shaft and the connection tunnel, remain hidden underground. 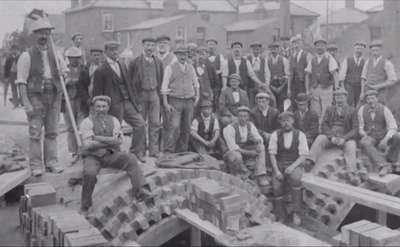 The Abbey Mills Pumping Station already exists, but in the future the site will be used to connect the main tunnel to the Lee Tunnel, a pipe that takes sewage to a sewage treatment site in the East London neighbourhood of Beckton. 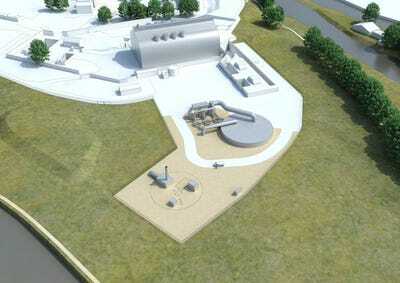 The existing Beckton sewage treatment plant will accept storm overflows that come through from the Lee Tunnel. 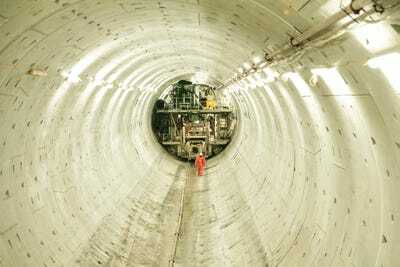 The entire project is expected to take seven years to complete, with construction on the main tunnel beginning in 2016. The UK government, which will act as an insurer for any unexpected costs, has been hyping the tunnel's benefits and claims that construction will generate more than 4,000 jobs. 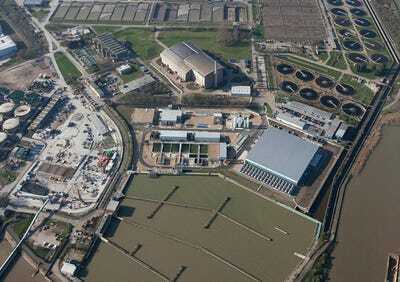 Thames Water has set up a separate company -- Thames Tideway Tunnel -- to finance and build the new sewer tunnel. The company will be in charge of raising bank debt and securing construction contracts. There is opposition, of course. Critics are concerned about the monstrous cost, the disruption it could cause to people near construction sites, and the potential ecological consequences (environmentalists are never really in favour of digging). 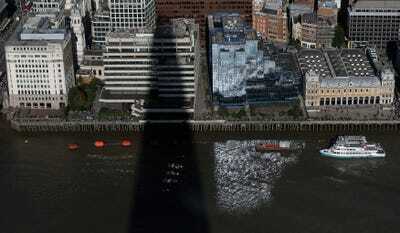 Still, some think it's a small price to pay for the problem the Thames Tideway Tunnel solves.